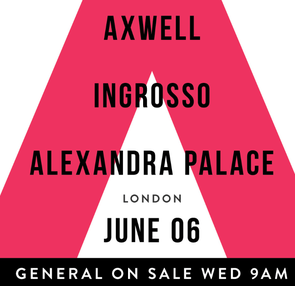 Axwell and Sebastian Ingrosso recently announced their return to London for a show at London’s Alexandra Palace on Saturday 6 June. With a string of hits and more than 15 million record sales spanning their extensive careers the newly formed duo are ready to unleash their new project, Axwell Λ Ingrosso on the UK. ‘Something New’ itself officially raises the curtain on their debut album following the release of club track ‘Can’t Hold Us Down’ - a track that was also premiered by Zane Lowe as his ‘Hottest Record In The World’ and subsequently named ‘Essential New Tune’ by Pete Tong on BBC Radio 1. After featuring on the recent global Beats By Dre campaign, the ad featuring ’Something New’ hit almost 17million YouTube views - with the track receiving an equally impressive 12 million plays on Spotify ahead of its UK release - and now the duo are set to unleash their live show on the UK at London’s Alexandra Palace. Playing massive events all over the world, Axwell and Sebastian Ingrosso have headlined shows at Governor’s Ball, Electric Daisy Carnival, Ultra Japan, V Festival over the last 12 months and are now also set to headline the Ultra Music Festival in Miami - as well as close out Coachella - with many more live dates still to be announced. Earlier this week the band also revealed their new video platform AXWELLINGROSSO.TV, featuring new music videos, fan videos and short films with music from their forthcoming album on Def Jam / Virgin/EMI. The platform has since premiered the official music video for ‘Something New’ and a special “We Belong To Something New” fan video featuring footage from thousands of fans and live clips from some of the duo’s biggest shows. Tickets go on general sale tomorrow. For most recent news you have to go to see web and on web I found this site as a finest website for latest updates. Hello, i believe that i noticed you visited my website thus i came to go back the favor?.I'm trying to find issues to enhance my web site!I assume its good enough to use some of your ideas!! A person essentially help to make significantly articles I might state. This is the very first time I frequented your web page and so far? I amazed with the research you made to create this actual publish incredible. Magnificent job! What's up colleagues, fastidious post and fastidious arguments commented at this place, I am genuinely enjoying by these.